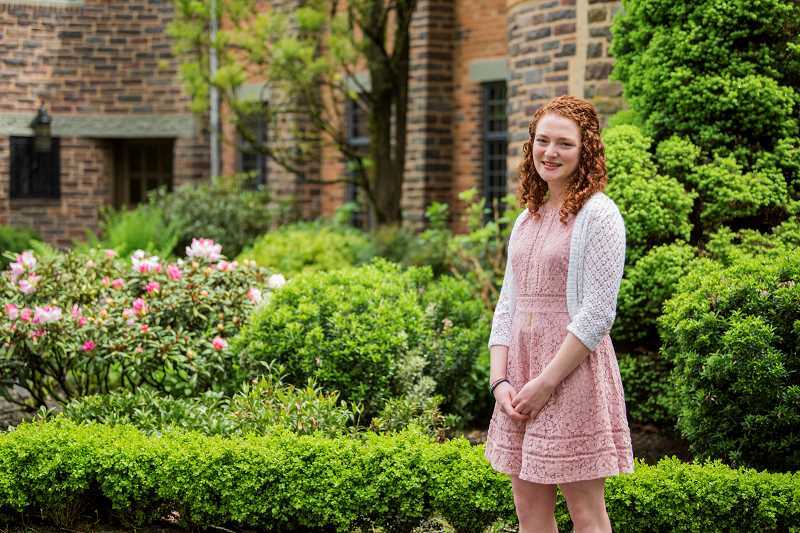 Lewis & Clark College alumna Katie Kowal has been awarded a prestigious Rhodes Scholarship, an international postgraduate award that allows students to study at the University of Oxford. Kowal graduated from Lewis & Clark with a double major in physics and political science in 2017. She now works in Washington, D.C., as a science policy fellow at the Science and Technology Policy Institute. The Rhodes Scholarship is a prestigious one. Kowal was one of only 32 scholars from the United States selected out of the more than 900 who applied after receiving a recommendation from their university or institution. The scholarship was created in 1902 to recognize students not only for their outstanding scholarly achievements, but also for their character, commitment to others and to the common good, and their potential for leadership in whatever direction their careers may lead. The Rhodes Trust pays all college and university fees; provides a stipend to cover necessary expenses while in residence in Oxford, as well as during vacations; and transportation to and from England. The total value of the scholarship averages around $70,000 per year and can be as much as $250,000 for scholars who remain at Oxford for four years in certain departments. In addition to the Rhodes Scholarship, Kowal was also a finalist for the Marshall Scholarship, a similar program housed at Cambridge University. Kowal's time at Lewis & Clark was no less impressive. In addition to her double major in physics and political science, she created the "Xplore" program for first-generation college students in STEM-related fields. She also won multiple awards, including the Shannon T. O'Leary award for intellectual promise and community impact. Karen Gross, an associate professor of English at Lewis & Clark, served as Kowal's advisor throughout her application processes for both the Rhodes and Marshall scholarships. She says she sees the Rhodes scholarship as an invaluable opportunity for Kowal. "Rhodes funds two to three years of study at Oxford, which will be a terrific opportunity for her education, her intellectual growth and research skills," says Gross. "It also plugs her into a network of Rhodes scholars past and present that will open up many opportunities for her in the future." Gross says that while rules precluded her from reading or helping with Kowal's personal statement in her application, she helped her navigate the application process in a more abstract way. "I don't see my role as helping someone fill out an application," says Gross. "It's more about helping a person see who they are and what they feel called to do. We spent a lot of time talking. Talking about what her aspirations are, what's motivating her, what are the matters that keep her up at night." While Gross says she is extremely proud that Kowal received the scholarship, she would have been just as proud if she had not been chosen. "What I try to express is that the award is an opportunity to think about what you want to do. It's not a yardstick to measure yourself by. Whether or not you get the award, it is not an end point, it is an opportunity," she says. However, Gross does admit she was "over the moon," when she found out her advisee was selected. Kowal says she is grateful for the help she received from Gross and others at Lewis & Clark. "LC has been instrumental in my ability to make it through this application process. Karen Gross provided much-needed counsel and support throughout my applications," she says. "I never would have been able to reflect as deeply on who I am and where I see myself heading without her guidance." In her current work at the Science and Technology Policy Institute, Kowal uses what she learned at Lewis & Clark to advise White House officials in the Office of Science and Technology Policy on the scientific research that should inform national policy. "Some of my favorite projects have included informing policy to enhance infrastructure resilience to electromagnetic pulse hazards, and identifying challenges and opportunities to address challenges in the launch approval process for nuclear material," Kowal says. Kowal and the other 100 Rhodes Scholars from around the world will begin their studies at Oxford in October 2019. For more information on the scholarship, visit www.rhodesscholar.org.